This paper by Keyi Tang compares how Ethiopia and Vietnam, two rising stars actively employing industrial policies as catalysts of structural change, have learned from East Asian countries’ experiences in developing their own special economic zones (SEZs). A Chinese and a Taiwanese overseas SEZ were the first SEZs developed respectively in Ethiopia and in Vietnam, which provided eye-opening lessons for domestic policymakers on how to better improve the legal and institutional framework, infrastructure, and administrative services needed for SEZ development. Overall, however, one of the biggest obstacles facing Ethiopia and Vietnam in learning from China’s experiences is the lack of local autonomy given to SEZs in their own administration. This empirical case study by Keyi Tang and Yingjiao Shen conducts an impact evaluation of Ghana's Bui Dam, a China-financed hydropower project completed in 2013. Through two difference-in-differences econometric models and an extensive literature review on relevant field research, this papers analyzes the environmental and socio-economic impacts of the Bui Dam on local households and communities. The authors’ empirical models show that the Bui Dam has significantly improved local urban households’ access to electricity and increased their ownership of some electric appliances. The uniqueness and diversity of socio-economic conditions in Africa call for a careful case-by-case examination to understand the real impacts of FDI on knowledge development. As such, this study aims to shed light on the knowledge transfer effects of Chinese investment in Africa’s manufacturing sector with a concrete case study of Ethiopia. This paper examines knowledge transfer mechanisms between Chinese investments and Ethiopian firms, institutions, and individuals at four different levels in the manufacturing sector. The lessons learned from this case may provide insights into China-African cooperation and Africa’s development process in general. This paper by Tang Xiaoyang looks into China-Africa Cotton (CAC), one of the first Chinese cotton firms to enter the African market. The study analyzes China-Africa Cotton’s operations in Zambia to investigate the impact on the technological development of the local cotton sector. As a new player in the arena, CAC has business models and a management style that differ from those of previous foreign investors in the region. Within six years, CAC has grown from a sole ginnery into a firm with tens of thousands of contracted outgrowers, and is now a comprehensive multinational business with an integrated value chain. Over the past decade, Chinese enterprises have made significant progress in developing new business ventures in Africa, yet there is ongoing debate about whether these Chinese enterprises contribute to local skill development of their host countries. To inform this debate, Qingwei Meng and Eugene Bempong Nyantakyi use survey data from the construction sector in Ghana to examine the heterogeneity in skill transfer to local workers in Chinese enterprises, other foreign and local enterprises, and the challenges faced by firms in local skill development. The results show that both Chinese and other foreign owned enterprises contribute positively to local skill development through the provision of general and specific training. However, Chinese enterprises have a higher propensity to provide short-term general training to local workers than those of other foreign enterprises. This paper by David G. Landry explores whether various institutional indicators among African countries impact their development finance from China and Western countries differently. This research is the first to explicitly compare the determinants of the value of Chinese and Western development finance received by other countries. It finds that bilateral trade relations and UN voting alignment have a stronger impact on China’s development finance than that of Western countries. The research also finds that institutional quality plays a much stronger role in predicting Western development finance than that of China, as China appears to disregard institutional quality in its allocation of development finance. Trilateral development cooperation is believed to reflect aid’s changing geographies while helping to forge new, more equitable partnerships. Chinese engagement in trilateral development cooperations has so far received limited attention, and this paper by Hang Zhou seeks to fill the gap. By drawing on field research from one of China’s first trilateral projects with traditional donors in Africa—a Ugandan cassava project co-initiated with Britain—this paper details key coordination challenges from the project implementation phase. More importantly, it also critically examines two often-claimed “advantages" of trilateral development cooperation: its contribution to more horizontal development partnerships and its role in providing recipient countries with more suitable technical assistance. 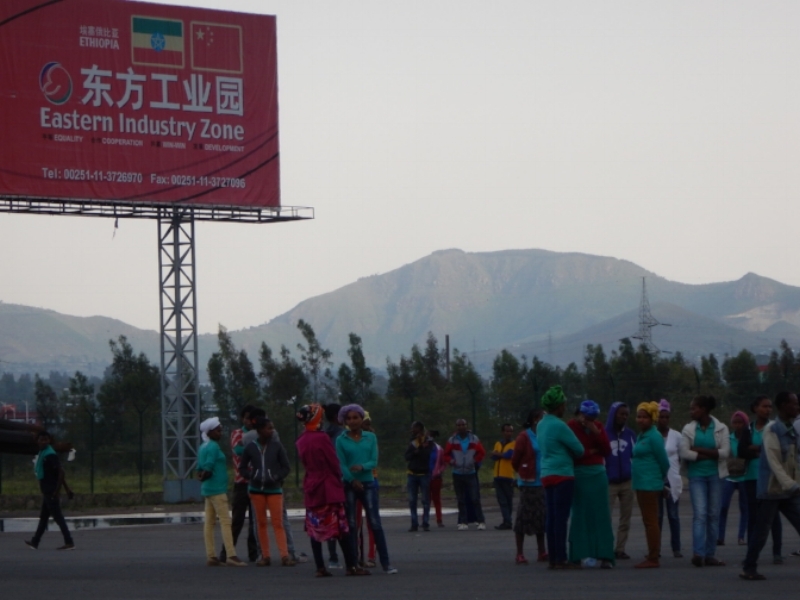 This paper by Ding Fei investigates the developmental impacts of Ethiopia’s Eastern Industrial Zone (EIZ) through a cross-company and cross-sector analysis of local worker experiences of working for, training with, and learning from resident companies. It highlights both similarities and differences in Chinese companies’ management strategies and training provisions, which are contingent upon industry sector, scale of production, and market conditions. While sixty percent of the surveyed local workers did receive training of varying quality and length, they were not satisfied with the training provision and promotion opportunities in current companies. The paper argues for concrete and targeted policy implementation by the Ethiopian government to enforce skills transfer by foreign investors, building of linkages between companies and local training institutions, and organizing zone-wide skills sessions. As a small, landlocked country with few natural resources, Rwanda has focused on becoming a knowledge-intensive business and technology hub rather than a labor-intensive manufacturing base. But in 2015, a Chinese garment manufacturing firm, C&H Garments, began operations in Kigali. This paper by Janet Eom finds that the Rwandan government’s shift towards creating jobs in the manufacturing sector, and implementation of requirements for training and hiring local workers, have been key to negotiating an agreement with C&H Garments that supports technology transfer to Rwandans. However, the C&H factory has faced obstacles such as cultural and linguistic differences; this paper suggests the exchange of African managers between countries may help. Finally, this study holds significance given that the Rwandan government’s desire to boost local manufacturing capacity has been at the center of recent trade tensions between Rwanda and the United States under the African Growth and Opportunity Act (AGOA). In a thoroughly researched piece, Brautigam, Tang, and Xia offer a preliminary analysis of the nature of Chinese manufacturing investments in Africa, focusing predominantly on four countries -- Ethiopia, Ghana, Nigeria, and Tanzania. Drawing on fieldwork conducted between 2014 and 2016, they explore the varieties of existing Chinese manufacturing investment and the sectors into which Chinese companies are investing. Several investors fit the model of Akamatsu’s “flying geese” (large firms seeking new locations for production as part of global networks and value chains), yet the authors also identified three other kinds of “geese”: large, strategic, local market-seeking geese; raw material-seeking geese; and small geese traveling together in flocks. The different kinds of firms offer different kinds of development opportunities and challenges for structural transformation in Africa. This paper by David G. Landry explores the Sicomines agreement and highlights the role risk has played from its inception a decade ago until now. This case reveals how, while simple on the surface, Resource-for-Infrastructure (RFI) deals carry significant risks for their signatories because of the long time horizon through which they operate. This has led the Sicomines agreement to experience many hurdles, both on the infrastructure delivery and resource extraction fronts. Landry employs financial modeling techniques to highlight the pitfalls of attempting to identify a “winner” in such ventures until they reach their conclusion. As demonstrated through the Sicomines case, the expected benefits of RFI deals can change swiftly and unpredictably. This paper explores the different modes of involvement of Chinese companies in South Africa’s solar photovoltaic and wind energy sectors. It also looks at how the differentiated technological and industrial trajectories of Chinese companies are interacting with South Africa’s unique national context. It reveals complex interactions between evolving market dynamics, and international and domestic factors in both China and South Africa. Such dynamics include the highly globalized nature of production chains in wind and solar PV, accompanied by increasingly consolidated markets, and ongoing trade disputes between Chinese, and EU and US solar PV manufacturing companies. This paper provides an in-depth case study of a set of local workforce development programs established by Chinese corporation AVIC International in Kenya. These programs' interesting characteristics challenge the stereotype that Chinese firms in Africa care little about local development. Although it is difficult to generalize from one example, AVIC’s case has the potential to change our understanding of Chinese companies’ contribution to skills development in Africa, showing at the very least that they can perceive such local investment as being in their self-interest. Chinese and African governments have expressed the desire for Chinese companies to do more in the area of skills transfer: AVIC’s strategy, as one of the earliest and most prominent, may well offer a model for the future. This paper examines the way local Kenyan politics have aﬀected implementation of the Standard Gauge Railway. It points to initial and immediate development opportunities for local content, jobs, and skills while arguing for a more rigorous assessment of the SGR's economic development potential. Unless Kenya overhauls its governance framework on the issues outlined in this paper, infrastructure projects risk overshooting initial budgets. This may also reduce the willingness of neighboring countries or foreign investors to engage in future initiatives in Kenya. This paper by Hezron Makundi uses empirical evidence from the Dakawa center in Tanzania to examine the role of agro-technology demonstration centers in diffusing selected agro-technologies to local farmers. The Dakawa center has struggled to balance the goal of technological diffusion with other interests, most notably the manifestation of China’s soft power and its commercial goal of operating a financially self-sustaining farm. Yet, despite these broad ambitions, the center has managed to contribute a great deal towards multi-actor efforts to lessen the information and knowledge barriers hindering the adoption of improved rice farming technology by farmers in Dakawa. This paper asks how the entry of Chinese firms in African uranium markets has impacted the agency of host African states to pursue strategies of economic and social statecraft. Using a comparative case study method with extensive field work, the authors examine how Chinese investment has impacted the uranium sector in both Niger and Namibia and, more critically, the impact investment has had on these states' ability to enact state agency across eight indicators in both economic and social domains. The paper finds that the impact has been mixed and uneven. This paper explores the extent to which labor conditions at Chinese firms in Kenya are a function of firm nationality, as opposed to other characteristics like industry, firm size, or length of time operating abroad. The authors investigate the question: in what ways do Chinese employers relate to Kenyan labor differently than American employers? They find that many Chinese and American managers hold similar attitudes towards the qualities and limitations of their Kenyan employees—although they express these attitudes in different ways. The paper argues that researchers and practitioners looking to address labor issues of Chinese firms in Africa must attempt to unpack the variation among Chinese companies, and place employment relations at particular firms within broader contexts. This paper examines how Kenyan, Chinese, and other international media professionals navigate the everyday production of media at CCTV Africa’s head offices in Nairobi, Kenya. It provides a portrait of the multifaceted experiences of CCTV Africa staﬀ, including their narratives of joining CCTV, producing news content, navigating relationships with managerial staﬀ, and planning for the future. While CCTV Africa’s employees are, on average, satisfied with CCTV Africa’s work environment and conditions, problematic areas regarding safety, interpersonal relationships, and training deserve further consideration and investigation. This paper uses Ghana as a case study to illustrate the extent to which Chinese manufacturing firms are driving manufacturing in an African country. Through the combination of desktop and field research, the author finds that the total number of Chinese manufacturing investments in Ghana indeed has been increasing during past decades, but quite a few projects were abandoned or not implemented due to concern over the unfavorable investment environment. The weak economic environment of Ghana itself proved to be limiting the technology transfer and local linkage between Chinese firms and Ghanaians. This paper evaluates the sustainable development impact of HydroChina’s involvement in the Adama Wind Farm project in Ethiopia and compares it with Vergnet, a French firm involved in the construction and financing of the similar Ashegoda Wind Farm. Through interviews with key stakeholders and detailed analysis of the negotiation and construction processes in both projects, the research concludes that the Chinese-financed and constructed Adama Wind Farm provided similar sustainable development benefits as the French-financed and constructed Ashegoda Wind Farm. Chen concludes that donor country characteristics may not be the main determinants of sustainable development impact. In Ethiopia's case, the host country played a crucial role. This paper looks at two hydropower projects in Cameroon—one financed by China Eximbank and one financed by a multilateral consortium led by the World Bank—to assess decisions around project financing, contracting, and implementation processes. It highlights several differences and similarities in institutional relations between project stakeholders, financiers, and contracted firms, and it examines the environmental, social and labor issues that arose in both projects. This analysis offers insight into Chinese practices around infrastructure project financing and assessment standards, as well as World Bank practices as a re-emerging donor in the field of hydropower. Madagascar’s abundant natural resources, low labor costs, and geographic location make it a potentially attractive destination for Chinese outward investment as rising wages in China and domestic competition increasingly drive firms to “go out.” The current wave of Chinese investment in the country may have significant implications for the development and potential transformation of the Madagascan economy, particularly for agriculture and manufacturing. This research finds some evidence of limited technology transfer occurring from Chinese firms in Madagascar, yet currently, Chinese investment remains small in scope, and is also constrained by a problematic policy environment. Chinese loan finance is often misunderstood in Africa. This paper provides an overview of a new database on Chinese loans and describes the research methodology for collecting this data. The authors report on the scale of these loans, their African recipients, and the sectors where borrowers are investing this finance. The paper also explains the Chinese system of securing risky loans with escrow accounts filled by exports and off-take arrangements. The data presented in this paper suggests that Chinese financiers have provided US$86.3 billion to African governments and state-owned enterprises between 2000 and 2014. Yet the paper also warns that debt levels are rising, the Chinese are unlikely to cancel these debts, and there are concerns that African governments may not be able to absorb the sharply increased pledges made by Chinese leaders in December 2015. Chinese construction firms are building African infrastructure and have been winning large percentages of World Bank contracts in Africa. At the same time, many anecdotal media reports and some scholarly works portray the quality of Chinese construction in a negative light. This paper seeks to initiate a more evidence-based analysis of the quality of Chinese firms’ construction work. The results indicate that Chinese firms performed similarly to OECD country firms on projects completed between 2000 and 2013; there are no statistically significant difference between their quality of work. The paper also examines possible underlying factors behind the negative perceptions of Chinese construction work, and it raises questions for further research. As China’s economic boom has boosted domestic growth and income, higher wage costs are moving an increasing number of Chinese firms overseas. This presents a favorable opportunity for less developed countries in Africa and Asia to boost their export and manufacturing sectors, as well as opportunities to absorb Chinese industries seeking to reduce costs offshore. This paper examines new trends of Chinese foreign direct investment and technology transfer in Nigeria’s manufacturing sector, and evaluates their potential to catalyze further industrialization in Nigeria. Fieldwork investigations of both Chinese and Nigerian firms in three regions of Nigeria show some evidence of positive, if limited, technology transfer, although they also reveal negative perceptions towards Chinese investment. While Nigerian economic policies have served to promote Chinese investment and skills promotion in Nigeria, a more coherent strategy is needed to leverage this new, growing source of capital and the potential resources it brings. This paper examines over 100 reported African hydropower projects with Chinese engagement, gleaned from media reports and lists compiled by organizations like AidData and International Rivers. The paper primarily finds that the Chinese are funding considerably fewer large hydropower projects than commonly believed. It also challenges widespread beliefs about Chinese practices, such as the use of resource-backed financing, the lack of social and environmental impact study requirements, and the use of Chinese-only labor. The authors found no evidence to support these assumptions in the hydropower sector.